Editing, Proofreading & ‘Final Eye’ are the semi-final and final stages of the production process. They are all about QUALITY CONTROL and involve a meticulous examination of your text to identify and correct any remaining errors. This is primarily achieved by being thorough and consistently accurate. While all three stages demand the close and careful reading of your text, each focuses on a different aspect of it and uses a different technique, and thus they are meant to be kept separate. EDITING: this semi-final step takes place on various levels, all of which are equally important. It involves the review of content (messaging, terminology usage, syntax, grammar, spelling, punctuation), structure (layout, format, font size, movement in paragraph alignment, pagination), style and the clarity of the overall message. We choose our editors carefully to ensure that only the most suitably qualified linguists are assigned to your projects. They have a keen eye for detail and they use specific and unique strategies that they have perfected and have come to rely on over the years. During the editing review, they can spot any typographical error or misprint before you present your slides to an audience or take your brochure to the printer. PROOFREADING: this final step also takes place on many levels but its purpose is singular: to ensure that your text is entirely error-free and ‘audience ready’. When our linguists have finished proofreading your text, you can be sure there won’t be a single dangling preposition or colon where a semi-colon would be best. We’ll help you make a good impression through your text by paying attention to its every detail. And we’re not suffering from content familiarity: we are more vigilant to find the mistakes in your text than you because we are not familiar with the content. So we’ll look at it with fresh eyes and spot the grammatical and typographical mistakes much quicker because we’re not reading what we expect to read or remembering what we had read before… we are reading what’s in the text for the first time and you can be sure we’re reading it word for word. FINAL EYE’: also known as ‘overkill’ by content risk-takers, this is the post-final step we take equally seriously as the former two and in which we view the content in its final context. In fact, we view it the way the intended audience will eventually view it. This includes the final formatting, layout and overall impression, and since it can be a time-consuming process, it requires patience and exceptional attention to detail. Finally, after all these steps are completed in our multi-level process, your text is ready for your audience. From start to finish, we offer all the different services required to ensure that your source document becomes all that it is meant to be in the target language. And post-production client feedback is always welcome and appreciated as we use it to continuously refine our craft and improve our offering. So how are these services we offer related to the Lincoln Memorial in Washington, D.C.? 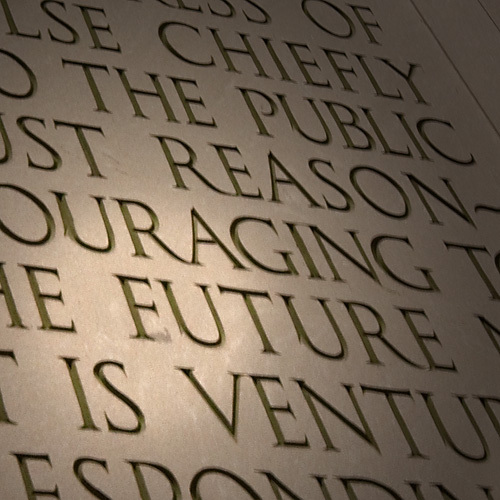 The eloquent, world-famous inaugural address, carved in stone no less, refers to America’s past, present, and ‘euture’. And what about Air Canada? Have you ever spotted a luggage tag that reads “This Baggage Has Been X-Rated at Point of Origin”? Don’t be that guy, come to us and let us help you. submitting your text to an audience? we read EVERY word, and we’ll ensure it’s top-notch!